Throw a Halloween Bug Club Party! Every year the U.S. recognizes National Chocolate-Covered Insect Day in October and thousands of Americans participate by hosting a Bug Club Party. Bug Club parties offer party goers the once-in-a-lifetime opportunity to proclaim, “I ATE A BUG!” because the only snacks on the menu include chocolate covered insects like crickets and super mealworms! If you think a bug club party sounds crazy, gross or weird….you might be surprised to learn how many countries consider bugs to be delicious delicacies! In fact, the United Nations said that there are more than 1,400 insect species eaten by around 300 ethnic groups in 113 countries worldwide. Purdue University hosts a world-famous Bug Bowl in April each year, and over 30,000 people attend. 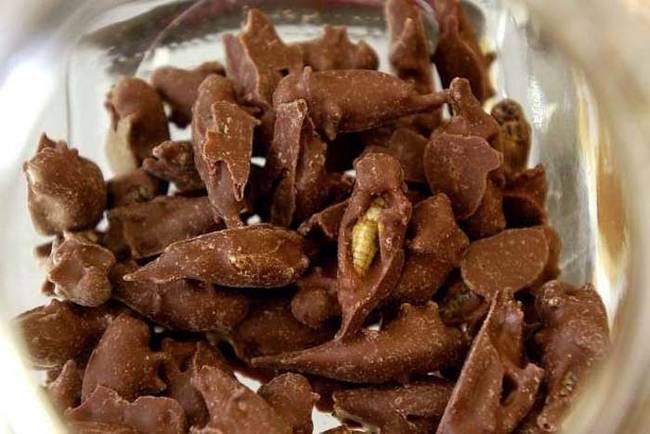 One of their most popular food items are the chocolate-covered crickets on a stick. Want to host a bug party? There are many ways to cook crickets and super mealworms at home. One of the most popular methods, of course, is to douse these edible insects in chocolate! If you’ve never tried them, they taste similar to chocolate-covered popcorn or pretzels. Insects are rather small. To serve a decent amount, you’ll need about 500 LIVE superworms, LIVE mealworms and/or 500 LIVE crickets, which (of course) you can also order online from Fluker’s. First, rinse the insects in a colander or strainer in cold water. Be sure to use a lid or plate to prevent escapees! Once drained, place the live insects in a large freezer bag and place them in the freezer for at least 30 minutes. If they are still moving after 30 minutes…add another 15 minutes. Next, preheat your oven to 225 degrees. Cover a large baking sheet with parchment paper. Remove frozen insects from the freezer and evenly spread them across the baking sheet. Roast for 1 hour and 30 minutes. Once roasted and cooled, remove the legs and wings from the crickets. Using either a double-boiler or the microwave method, melt your favorite white, dark, or milk chocolate coating and dip each roasted insect in the chocolate. Once dipped, place them individually on waxed paper and allow them to cool until the chocolate hardens. Your chocolate covered insects will store for up to 3 weeks in the refrigerator in an air-tight container, or until your bug party guests arrive!